Reciprocal verbs are a type of pronominal verb, meaning they have both a subject pronoun and a reflexive pronoun. In the case of reciprocal verbs, the reflexive pronoun indicates that the action of the verb is exchanged between two or more subjects acting upon each other. Les aigles se regardent. 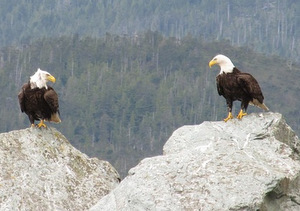 The eagles are looking at each other. Nous nous connaissons. We know each other. Ils se parlent souvent. They often talk to one another. All of the above verbs require a reflexive pronoun when they indicate that the subjects are acting upon one another. But remember than they can also be used non-reflexively, to express the verb’s action directed at someone or something else (or nothing, in the case of intransitive verbs). Ils se regardent. vs Ils regardent la télé. They’re looking at each other. They’re looking at the TV. Vous vous souriez. vs Vous souriez. You’re smiling at each other. You’re smiling. 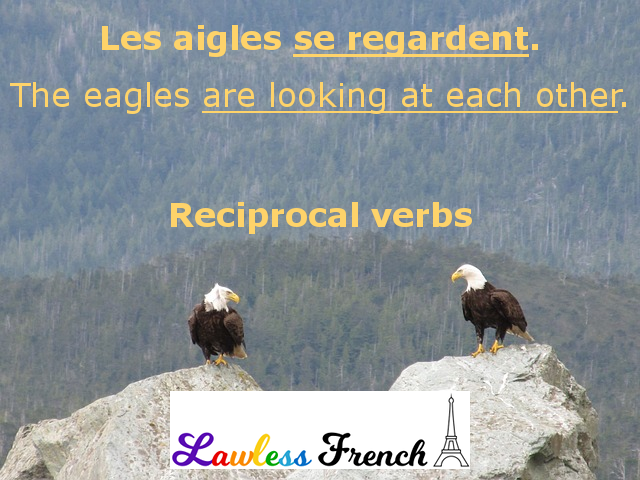 Reciprocal verbs are just one type of pronominal verb. See the main lesson on pronominal verbs for details on using reciprocal verbs in different tenses and moods.